We’re into the offseason now, and that means checking in on changing fantasy football values is a crucial part of our work. Today we’re looking at some changing stocks for dynasty leagues. Now that most head coaching positions have been filled, we have our first glance at what changes the 2019 season will bring. Remember, it was about this time last year that the Bears brought in Matt Nagy, who made Mitchell Trubisky fantasy-relevant, and when the Titans brought on Mike Vrabel, who we thought (incorrectly) would make Marcus Mariota would be a good buy-low option. Below are players who will see their dynasty rankings immediately altered because of this year’s changes. Now is the time to start your 2019 plans. One of the more disappointing coaching hires, Gase did nothing in Miami to warrant a second job so quickly. Sure, one could argue he didn’t have much in the way of personnel, but I would counter that his offense, even with personnel changes, gradually got worse from ranking 24th in yards and 17th in points in 2016 down to 31st and 26th, respectively, this past season. Darnold is the player whose fate most relies on Gase. He had an inauspicious start to his career, throwing for just 2,800 yards and 17 touchdowns but also 15 interceptions his rookie season. Granted, his top running back couldn’t clear 700 rushing yards and his top receiver couldn’t clear 800 receiving yards so it’s not a full picture of what Darnold can do. However, unless the Jets seriously upgrade their position players, neither Gase nor Darnold stand much of a chance of doing any better than they’ve done. To be fair, Gase has had success as a play-caller — that’s the reason he keeps getting jobs. His best work was Denver when he was paired with Peyton Manning to produce two top-five fantasy seasons in his two years there. So we know he’s at least capable of having success … if he as a Hall of Famer at quarterback. Verdict: Buy. Why am I buying? Because Darnold’s dynasty value will probably never be lower. If he tanks it this year, how much lower can he go where you still receive value in a trade? On the other hand, we’ve seen the peak of what Gase can do and it’s pretty high. 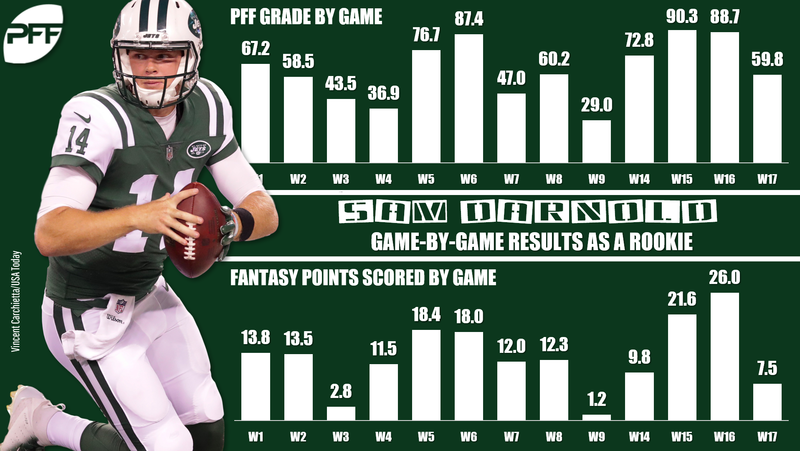 I think Darnold ends up somewhere between Gase’s peak (Denver) and valley (Miami) where no Dolphins quarterback finished higher than 17th in fantasy scoring. Recommending buying Baker Mayfield would be too obvious (you should definitely do that) so we’ll look elsewhere and go to the Browns backfield. And while Mayfield has gotten most of the attention as the beneficiary of Kitchens being promoted to offensive coordinator last season, Chubb made great strides too. He carried the ball at least 20 times in each of the first three games Kitchens took over, averaging over 100 rushing yards and scoring in all three contests. All of this after not carrying the ball more than three teams in any of the Browns first six games. Thank you, Hue Jackson. Verdict: Buy. Buy right now if you can. Not only does having Kitchens continue calling the plays bode well but no matter who was coaching, Chubb was primed for a breakout. He finished the season as PFF’s best in elusive rating, charting over 10 points higher than the next-closest running back with at least 150 carries. He also led the league in yards after contact per attempt with 4.47. Despite just two years of experience as an offensive coordinator, LaFleur is actually one of the more experienced new hires (see above and below) and was the first branch of the Sean McVay coaching tree when he went from the Rams to the Titans to be their play-caller last season. About this time last season, fueled by LaFleur’s hiring, the Titans were one of the more sought-after teams when it came to fantasy assets with many believing Tennessee’s offense would be turned into the AFC South’s version of the Rams. That … didn’t happen, as the Titans offense finished 25th in yards and 27th in points. It’s actually a little curious that LaFleur got the job given his limited experience and seemingly lack of success but here we are. Aaron Rodgers will continue to be Aaron Rodgers no matter the coach, but Jones could see a huge boon to his dynasty value. Already a fantasy favorite, Jones played in only 12 games this season between suspensions and injuries but was super-efficient when he did play, leading the league with 5.48 yards per carry. Being 14th in elusive rating contributed to that, forcing 33 missed tackles on just 159 touches. That last number has always been the challenge for Jones owners as the Packers just didn’t use him enough to truly be a fantasy stud. However, with LaFleur in the fold that could change. Whether it was the Rams two seasons ago or the Titans this past season, both offenses with LaFleur as the coordinator were top 10 in rush attempts and rushing yards. Verdict: Buy. Jones scored eight times in his 12 games this season despite never seeing more than 17 carries in any game. In fact, the most carries he’s ever seen is 19 in a game early in his rookie season. If LaFleur is consistent, the run game will be more of a priority in Green Bay. It’s hard to gauge what kind of offense Fangio will want without knowing who his coordinator will be. However, it’s fair to look at his recent stops and what made them successful. In both San Francisco and this past year in Chicago, the offenses were at their best running the ball. Each year Fangio was in San Francisco under Jim Harbaugh, the offense was in the top-10 in rushing attempts and yards and utilized multiple backs and the quarterback in the run game. The same went for the Bears this past season. Ideally, Fangio would try to replicate what made those teams successful and run the ball more than Denver did this season where they ranked just 21st in rush attempts. On his new team, Phillip Lindsay has earned the starting job in 2019 after averaging almost 5.5 yards-per-carry on almost 200 carries this season. But people forget that his backup, Freeman, was the higher-rated running back before the season. Drafted in the third round of the 2018 draft, Freeman showed flashes at Oregon of being the best in his class tied for the best single-season overall grade any back in this draft class had during their college career. He also had the 14th-best elusive rating of any back in the class and seemingly walked into an ideal situation in Denver without a veteran after C.J. Anderson was let go. But Lindsay exploded and Freeman took on a complimentary role. Verdict: Buy. Lindsay will be the higher-ranked player, but Freeman will be the better value. Despite playing second fiddle to Lindsay, Freeman still had a good season, averaging 4.0 yards per carry while finishing in the top-20 in elusive rating (Lindsay finished 45th) and 14th in yards after contact per attempt and could see an ample amount of carries. Let’s face it — any receiver on the Cardinals on the roster in 2019 was going to see a bump. Kirk, a second-round pick in 2018, is the best bet. Larry Fitzgerald might retire, while everyone behind Kirk (at the moment) is meh. Kirk’s rookie season was encouraging when you consider the dumpster fire that was the Steve Wilks era and a Cardinals team that had the worst record in the NFL. He played in only 12 games but tallied 43 receptions for 590 yards partly due to how reliable he was in that limited time, dropping just three passes on 46 catchable targets. Also consider he was forced to play more outside than he did at Texas A&M, where he ran just 21 routes from the outside in his final college season. The slot in Arizona in 2018, of course, was occupied by future Hall of Famer Fitzgerald, who logged 274 snaps from the slot compared to just 103 for Kirk. But even with more slot snaps, Fitzgerald finished with just 69 receptions for 734 yards, or just 26 receptions and 144 yards more than Kirk did. Verdict: Buy. Kirk will be a hot name in dynasty circles this offseason and he should be. If Fitzgerald comes back, Kirk can keep going outside and build on a solid rookie season with a team that is sure to be passing a ton. If Fitzgerald leaves, he can move back to his natural position in the slot and continue to learn under Fitzgerald while still seeing a ton of targets. Unlike many of the coaches above, we finally have a coach with plenty of experience both as a coordinator and as the head guy. Arians was an offensive coordinator for nine years (including the year he stepped in for head coach Chuck Pagano in Indy) with another five years as the head coach in Arizona. He’s flexible when it comes to his offense as evidenced by the fact that his teams finished in the top three in rush attempts in three different seasons while finishing in the top four in pass attempts in four separate ones. There’s no doubt he’s been brought in specifically to develop quarterback Jameis Winston just like he successfully did with Ben Roethlisberger, Peyton Manning, and Carson Palmer during the latter’s renaissance. So what’s that mean for this offense? As mentioned above, Arians can play to a team’s strengths. For Tampa, that’ll be the passing game with Winston and receivers Mike Evans, Chris Godwin, slot receiver Adam Humphries, and (possibly) DeSean Jackson. This will also include former first-round tight end Howard. Howard was in the midst of a breakout last season when he was fantasy’s sixth-highest-scoring tight end with 34 receptions for 565 yards and six scores through 10 games before an ankle injury ended that. 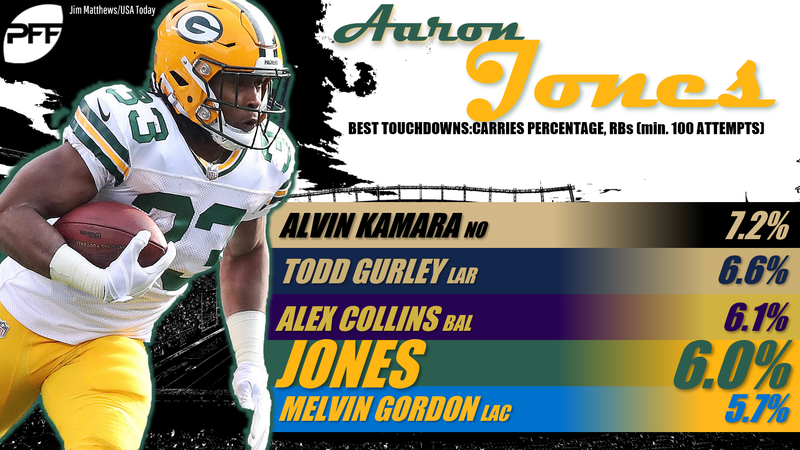 He was efficient too, finishing behind only George Kittle and Travis Kelce in PFF’s yards per route run at 2.26. Verdict: Sell. As good as Howard has been, and could be, Arians simply isn’t conducive to successful fantasy tight ends. 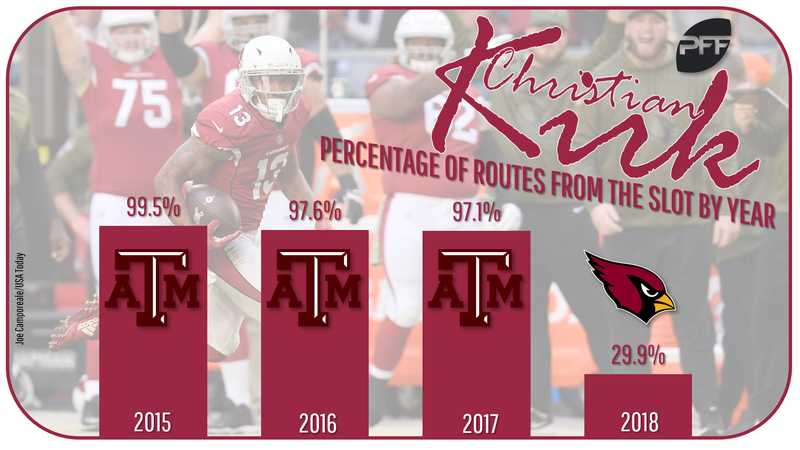 Across his five-year tenure in Arizona, the top tight end for Arians averaged only 50 targets, 32 receptions, for 348 yards per season and were often fourth or fifth on the offense in targets. Tampa has plenty of pass-catchers to replicate the target distribution Arians had in Arizona, which could push Howard down in priority.